Wearables tend to be the world’s best-selling consumer electronics product after smartphones. Autonomous or smart wearables are projected to exceed 400 million units by 2025, with a compound annual growth rate of 56.1% which are well above laptops and televisions. The US wearable biosensors market is expected to exceed more than USD 11.5 billion by 2025 at a CAGR of 8.5% in the given forecast period. The transition from basic to smart wearables opens up a slew of opportunities for vendors, app developers, and accessory makers, for instance, Android Wear, Tizen, and WatchOS are moving ahead with more advanced and improved version of user interfaces, user experiences, and applications, which in return will raise the expectations of what a smart wearable can do, and each platform is vying for best-in-class status. The Richline Group, a jewelry manufacturer owned by Berkshire Hathaway, is rolling out a customizable line of smart jewelry called Ela (Elegant Lifestyle Accessories). Ela pieces alert wearers when they are receiving a call or text from selected contacts. However, lack of versatility, smaller size and less penetration among the population tends to hamper the wearable biosensor market. Further, the major challenge for the wearable technology is to tackle with the security and privacy issues. As the wearable are connected over internet, it can be hacked in its application and the data stored can be stolen, posing high risk to the citizens as well as to the nation. Investments in new construction projects that include population health initiatives, ambulatory care, mental health, safety net clinics. Healthcare spend continues to grow in US; the forecast is that it will increase to 30% of GDP from the current 20% by 2050. Unit sales of wearable technology passes 42 million, but growth is slowing owing to new technology value is doubted and dieters not buying in as expected. . However, sales continue to grow for wearable tech and sales for specific brands have already seen some reversals of fortune, including wearable cameras from GoPro and Apple smartwatches in US. Health & wellness monitoring dominated the market and accounted for the market share of 25% in 2017. Monitoring and timely intervention are extremely important in the continuous management of health and wellness among all segments of the population, but particularly among those with mild dementia. Home diagnostics is the major end user segment and accounted for the highest market share of 27.7% in 2017 in the United States wearable biosensors market followed by point of care testing and hospitals owing to wearable biosensor advances in data analysis and artificial intelligence techniques which are responsible for paradigm shift in remote management and monitoring of chronic disease. United States Wearable Biosensors Market Outlook 2017-2025, has been prepared based on an in-depth market analysis from industry experts. The report covers the competitive landscape and current position of major players in the Wearable Biosensors market space. The report also includes porter’s five force model, SWOT analysis, company profiling, business strategies of market players and their business models. “United States Wearable Biosensors Market Report” also recognizes value chain analysis to understand the cost differentiation, pricing models to provide competitive advantage to the existing and new entry players. 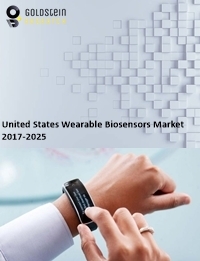 Our United States Wearable Biosensors Market Report comprises of the following companies as the key players: Google Inc., Microsoft, SAMSUNG, Apple Inc., VitalConnect, Huawei Technologies Co., Ltd., Withings SA, Robert Bosch GmbH, Broadcom, Infineon Technologies AG, mCube, Inc., Knowles Electronics, LLC., Panasonic Corporation, TE Connectivity Ltd., Asahi Kasei Corporation, NXP Semiconductors, Invensense, Inc., Texas Instruments Inc, ARM Holdings PLC, Vancive medical technologies, Jaw bone, Tactio health group, and Zephyr.